Last week Gold Coast Marine Distributers were kind enough to let our coating specialists sit in on a product meeting focused on AwlGrip’s new Awlwood wood coating system. The Awlgrip product rep was on hand to roll out their new product, no pun intended and as coffee was poured and stools circled the meeting got under way. In essence Awlwood is positioning it’s self to be the longest lasting and most damage resistant wood clear system in the marine industry. Awlgrip credits this to the unique Flex Link technology inherent in the product formulation, a cross link of Alphatic compound polymers braided together allowing for maximum flexibility and adhesion between the primer and topcoat. Flexibility in a coating is crucial. Vessels taking head seas or any pounding often experience that “Shiver me timbers” moment when the vessel is bending and twisting on it’s keel. This often results in the cracking of the coating along cap rails and tables which will then need to be stripped down to bare wood and refinished. 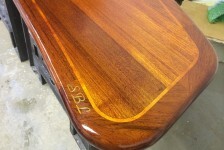 Awlwood’s chemistry prevents this so long as the prime and topcoat are used together in sequence. What’s cool is when the coating does fail i.e : the dayworker drops a heavy polishing tool on the emaculatly finished aft deck table, the coating is suppose to give from the top down instead of spider webbing from the base coat up. This allows for easier superficial repairs as oppose to having to strip down the table and rebuild millage. Awlwood’s topcoat can be applied by spray, brush, roller and over existing urethane finishes if surface are sanded and prepped correctly. The clear gloss finish has a high building fast-curing formulation which allows for multiple applications per day over a wide range of temperatures and humidity. After spraying a few tables we have found the product to be extremely scratch resistant and adverse to chemical and detergent etching common with clears. The gloss finish can be wet sanded and polished to high shine.The primer and clear come as 1 part so no mixing is necessary. Long gone are the caustic mixing of activators and catalysts although a spray and brush reducers help to thin the product should the conditions call for it. Below is look at the new finish from Awlgrip. Big thanks to Gold Coast for keeping us in tune with these new products and technologies.